David Miles (Miles Better News Agency) investigates this iconic American machine. 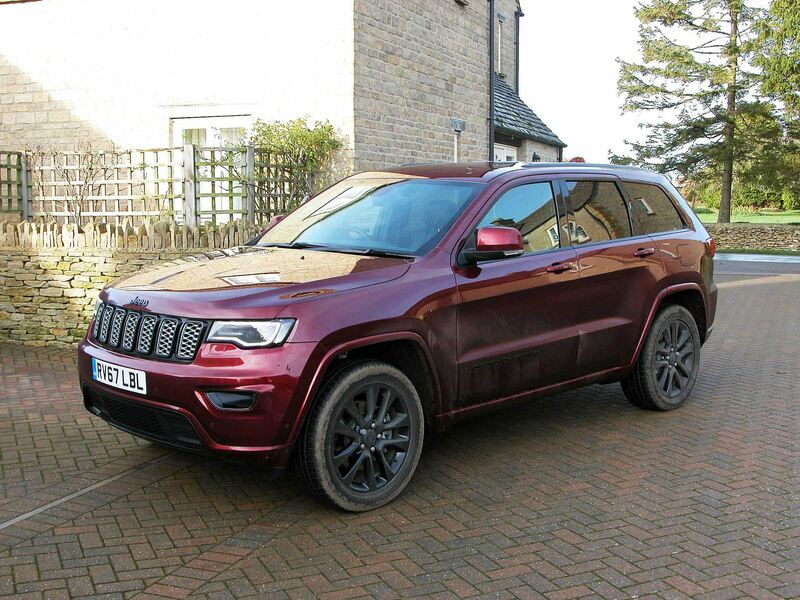 The Jeep Grand Cherokee 4×4 is a globally recognised large, five-seater, hard-core heavyweight and seriously capable off-roader with a long history and high specification. It has evolved over many years since 1993 with over five million sales, the most recent in the hands of the Fiat Chrysler Automobiles alliance. 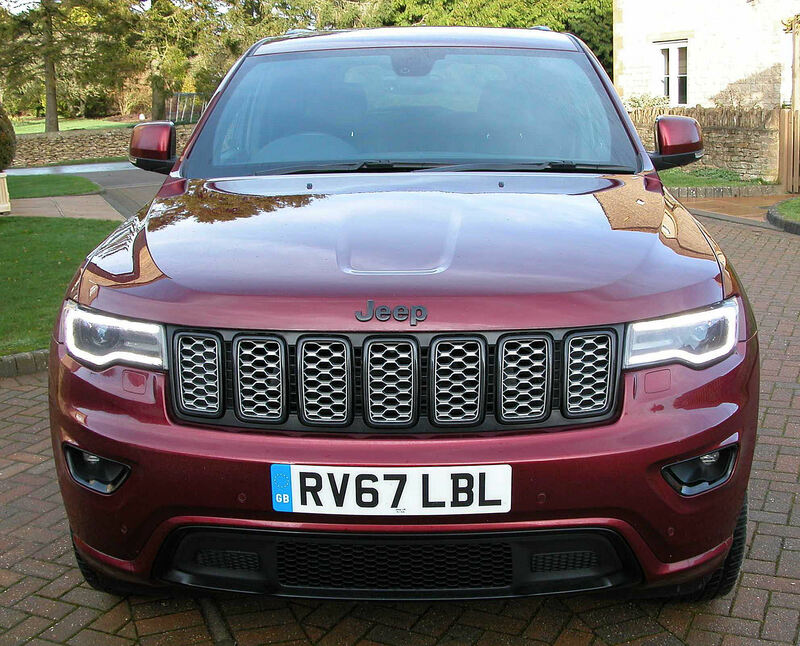 Now in its fourth generation the Jeep Grand Cherokee range consists of the 3.0 litre CRD V6 250 hp 4×4 eight speed automatic diesel powered models, with specification levels consisting of Limited Plus at £48,880, Night Eagle at £49,880, Trailhawk at £51,380, Overland at £52,620, and Summit at £56,420. But for deep-pocketed petrol power enthusiasts there is also just available, with very limited supply, the 180 mph Trackhawk with a supercharged 6.2 litre V8 Hemi 710 hp, 868 Nm (640 lb.ft) petrol engine and priced at a huge £89,999. 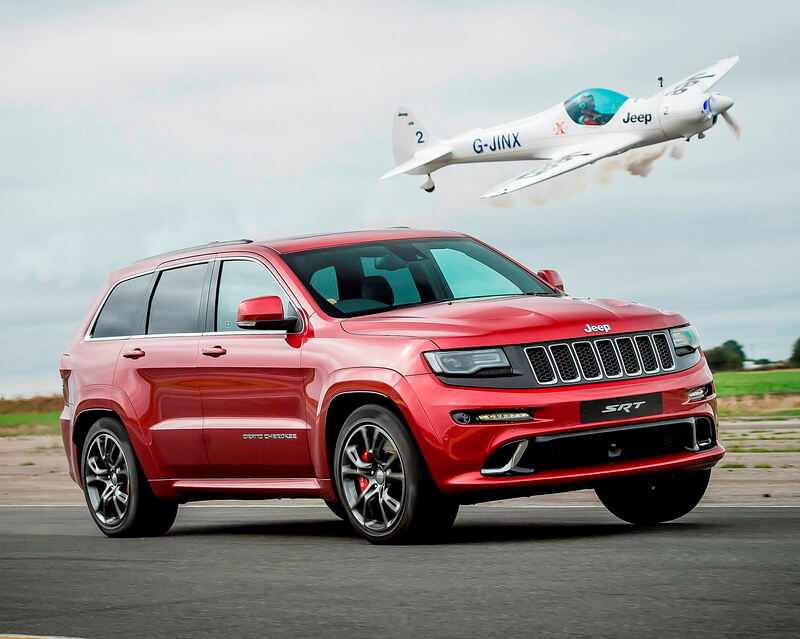 So the Jeep Grand Cherokee’s story is one of evolution with numerous modifications, technical updates, improvements in quality and with the embracing of up-to-date safety equipment plus improvements in overall refinement, along the long trail of its history. In recent years it has moved from a body on a ladder frame chassis to a monocoque integral body and platform design, rumoured to have come from the Mercedes M-Class under the past Daimler Chrysler tie-up and now fitted with a VM Motori diesel engine adopted by the Fiat Chrysler partnership, rather than a Merc unit. I have recently had a longer driving spell with the Night Eagle version with the core 3.0 litre V6 250 hp turbodiesel engine with a significant torque output of 570 Nm (420 lb.ft) from just 1,800 rpm matched with a new eight speed automatic transmission and the renowned Jeep Quadra-drive 4WD Selec-Terrain Traction Control system. This features five driving modes via a rotary controller, from Auto through to Rock with High/Low ratio select button and Hill Descent Control. This heavyweight version weighs in at £49,880, which looks expensive but really isn’t when you consider the price of its competitors. The competition includes the significantly more expensive Audi Q5/Q7, BMW X5/X6, Volvo XC90 and of course various Range Rover models, the Land Rover Discovery and Toyota Land Cruiser. Other similarly sized competitors which are cheaper but still capable 4x4s, include the new Mitsubishi Shogun Sport, Hyundai Santa Fe and Kia Sorento. It’s only the Range/Land Rover models and Toyota Land Cruiser that can compete with the Grand Cherokee’s off-road performance. The Jeep Grand Cherokee is a big, chunky and imposing large SUV but it only has five seats, unlike some of its larger competitors. But that means five big comfortable and chunky seats backed up by a large 782 litre (27.62 cu.ft) boot and when the rear seats are folded down this goes up to 1,554 litres (54.88 cu.ft). In addition this heavyweight off-roader can tow a massive 3,500 kg (7,716 lb) so it’s ideal both as a workhorse, towing stock trailers or promotion units, or for leisure pursuits such as horse boxes, caravans and boats. It’s a long, wide, tall and handsome looking vehicle with a length of 4,828 mm (15.84 ft), a width of 1,943 mm (6.37 ft) and a height of 1,792 mm (5.88 ft) and this latter figure means the ground clearance is excellent for off-road work. The wheelbase is 2,915 mm (9.56 ft) so in addition to the large boot space it provides excellent rear seat legroom. It’s somewhat of a lazy handling vehicle which given its size is no bad thing for owners. Yes the Audis and BMWs are sharper handling large SUVs with better body control on winding country roads but personally I liked the more relaxed handling and ride comfort credentials of this Jeep. Not so good was the response from the electronic power steering which didn’t give enough feel and feedback through to the steering wheel, even though it had selectable modes. Another niggle is the lack of space in the driver’s footwell, harking back to the overall design that this platform is more suited to left hand drive models than right hand drive versions and the footwell space is further restricted by the archaic foot operated parking brake. The high level dashboard further adds to the vehicle’s solid interior appearance and there is plenty of soft-touch chunky and well padded interior trim throughout. The centre of the fascia panel houses an 8.4-inch Uconnect touchscreen which operates the DAB radio, sat-nav and Voice Command functions. The heating and ventilation controls can also be operated via the touchscreen or duplicate and easier to use controls positioned in the lower section of the centre console stack. Closer to hand in the centre stack is a rotary controller to select the various driving modes from Auto through to Rock driving conditions and there are switches for High and Low ratio settings plus variable speed Descent Control. There are also Eco and Sport driving modes to select from. Being a Jeep the specification is also comprehensive, adding to its value-for-money credentials. 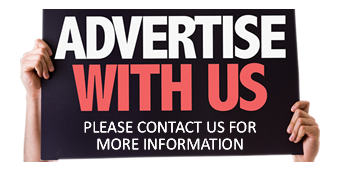 You will pay more for German competitor models because their specifications always include extra cost options which are standard with the Grand Cherokee. The Night Eagle spec level I tried had black leather upholstery with suede inserts, gunmetal coloured trim inserts, heated front and rear seats, heated leather bound steering wheel, removable/rechargeable boot light, eight way powered driver’s seat with memory function and six way front passenger’s seat, nine speaker sound system, cruise control, powered tailgate, all round electric windows, ParkSense front and rear parking aids with a ‘Stop’ alert, ParkView reversing camera, Keyless Entry with push-button start, auto lights and wipers and Trailer Sway assist. It is a very comprehensively equipped, good quality package and now it comes with a five years/75,000 mile warranty for good measure. 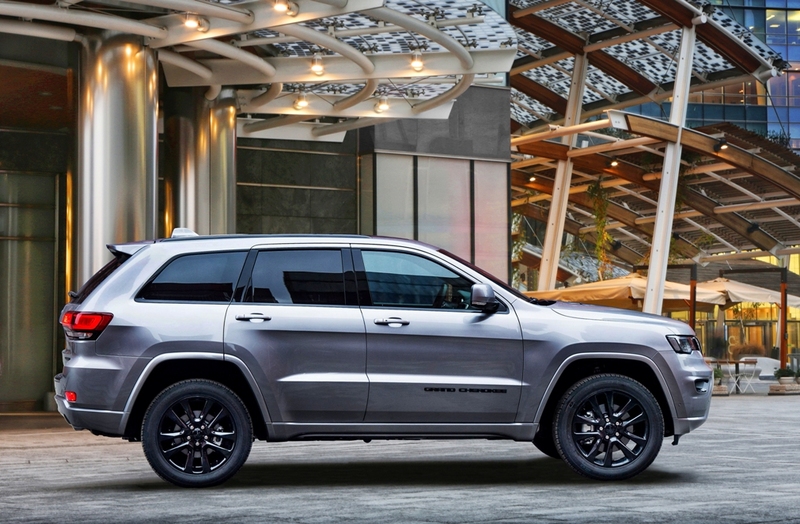 Outside the Jeep Grand Cherokee retains the styling cues we expect from the Jeep brand. These include the 7-slot iconic grille, clamshell bonnet, elongated wheelarches and its overall imposing tough stance. The test car also had 20-inch alloy wheels, nice to look at but with low-ish profile tyres they didn’t easily absorb impacts from potholes, but to be fair the ride was still more comfortable and less fidgety than most of its premium brand German competitors. 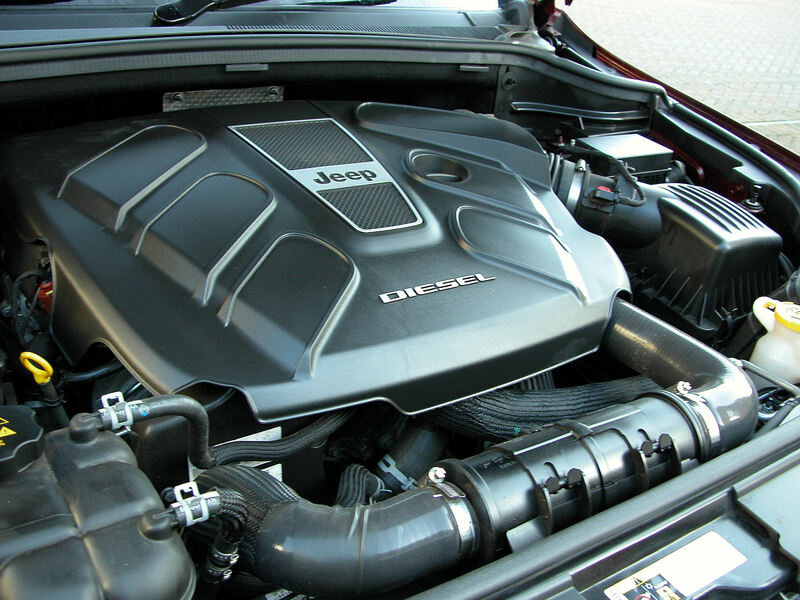 Under the ‘hood’ or bonnet as we know it, is a strong, smooth and quiet 3.0 litre V6 turbodiesel engine pushing out 250 hp and most importantly to give it excellent response 570 Nm (420 Nm) of torque from 1,800 rpm. With the adoption of a new Stop/Start function and the electronic powered steering, this has reduced by 14 g/km the CO2 emissions which are now 184 g/km. This means that VED First Year diesel rate road tax is £1,240 before reducing to the Second Year onwards rate of £140, but remember £310 has to be added to that latter figure for five years as the vehicle costs over £40K. Company car executives will pay the maximum 37% Benefit-in-Kind tax rate. 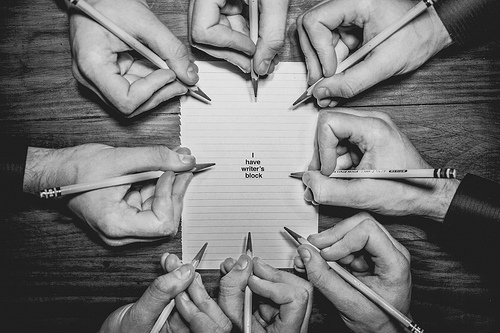 Insurance is Group 43E. The Official Combined Cycle fuel consumption figure is 40.4 mpg and my week of test driving returned a final figure of 31.4 mpg but for much of the time on longer higher speed runs the figure was 35.2 mpg, it was only local in-town driving that penalised the overall figure. Top speed is 126 mph the zero to 62 mph acceleration time is 8.2 seconds, fast enough for this type of vehicle. The eight speed auto box produced gearshifts in a leisurely way both up and down the ratios; it doesn’t have the sharpness in gear changing speeds that we experience with Audis or BMWs. Although I didn’t get much time to venture off-road I have driven various generations of Grand Cherokees in past years and they are always the real-deal in that type of driving environment, and I know the softer engine and gearchange responses will be ideal for those conditions as well as easy to drive in low speed on road, in-town driving conditions. 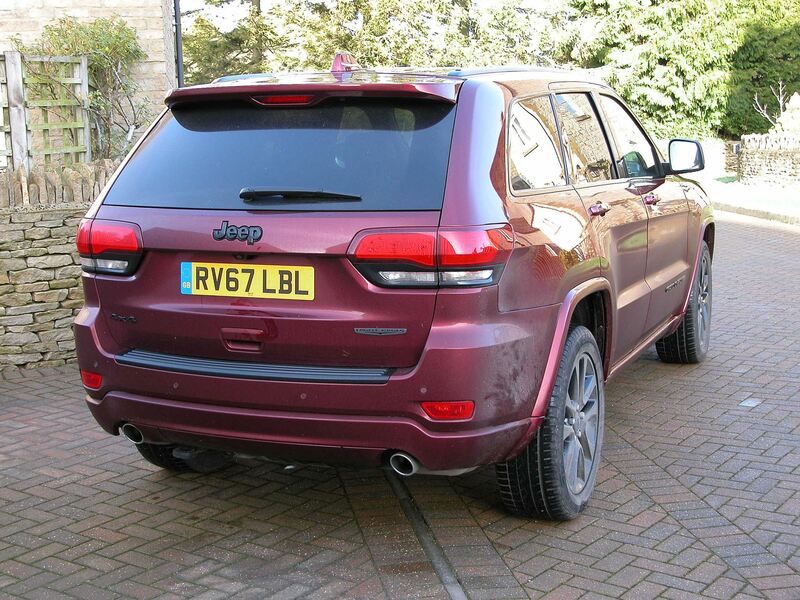 For: Best generation of Grand Cherokee so far, well-equipped, roomy, comfortable, options on other large SUVs are mostly fitted as standard on this vehicle, brilliant performance off-road, very capable towing vehicle, new longer warranty. Jeep Grand Cherokee Night Eagle 3.0 MultiJet II, V6 turbodiesel auto 4WD. Engine/transmission: 3.0 litre, V6, turbodiesel, 250 hp, 570 Nm (420 lb.ft) of torque from 1,800 rpm, eight speed automatic, Quadra-drive 4WD with Selec-Terrain Traction Control, variable driving modes, high/low ratios, descent control. Performance: 126 mph, 0–62 mph 8.2 seconds. Fuel consumption: Combined Cycle 40.4 mpg (31.4 mpg overall on test). 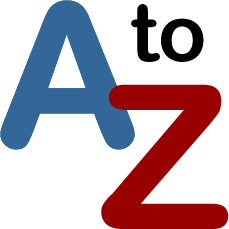 Emissions and taxation: CO2 184 g/m, VED First Year diesel rate road tax £1,240, then £140 Standard rate + £310 annual supplement for five years as it costs over £40k, BiK company car tax 37%. Dimensions/capacities: L 4,828 mm (15.84 ft), W 1,943 mm (6.37 ft), H 1,792 mm (5.88 ft), wheelbase 2,915 mm (9.56 ft), kerb weight 2,328 kg (5,132 lb), boot/load space 782 to 1,554 litres (27.62 to 54.88 cu.ft), braked towing weight 3,500 kg (7,716 lb), five doors/five seats.